On September 13th at the Rivolto Air Base in Udine province, Lamborghini joined with Ducati and the Italian Air Force in a special celebratory day dedicated to "Passioni Tricolori" (Tricolour Passion). The event saw the coming together of the three Italian entities, each synonymous with excellence in their respective fields, well-known and appreciated throughout the world. The Italian National Aerobatics Team performed a demonstration flight, after which Andrea Dovizioso along with Luigi Dall’Igna and Lamborghini Squadra Corse driver Mirko Bortolotti experienced the thrill of aerobatic flight aboard the team’s Aermacchi 339 aircraft. 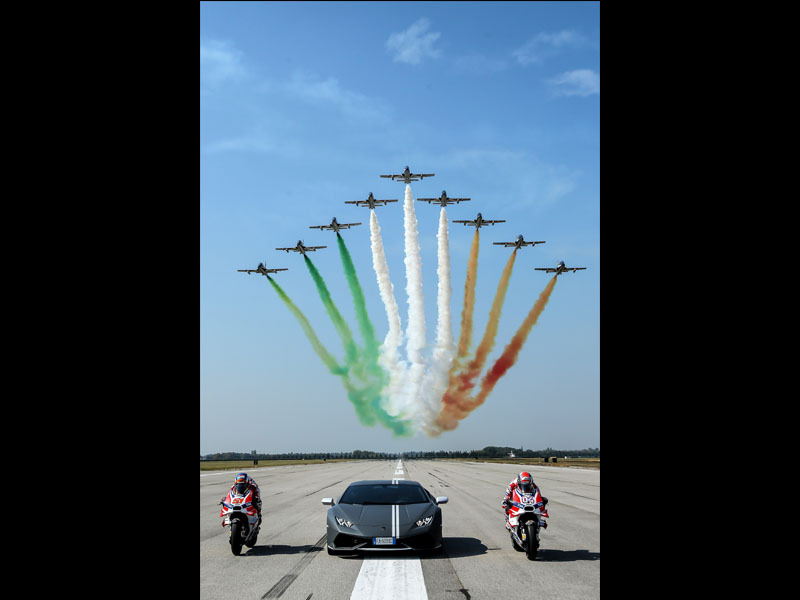 In return, Lamborghini’s Huracán and Aventador cars and Ducati’s Desmosedici GP bikes stayed firmly planted on ‘terra firma’, demonstrating their speed and handling prowess on the connecting roads of the air base, while the Italian National Aerobatics Team flew over them.